What exactly is the Icom 7300 Mini Scope and how does it differ from the Spectrum Scope? That M.SCOPE button on the 7300, I have used it plenty thinking it stood for “Monitor Scope”, but no, it stands for Mini Scope. Here’s what the Icom 7300 full manual says about it on page 5-4. I think every Icom 7300 owner knows what the Icom 7300 Spectrum Scope is. Just push the MENU button on the front and then tap the SCOPE button on the LCD. That brings up the Spectrum Scope. Says it, right under the frequency display, “SPECTRUM SCOPE”. The IC-7300 has two spectrum scope modes. One is the Center mode, and another one is the Fixed mode. 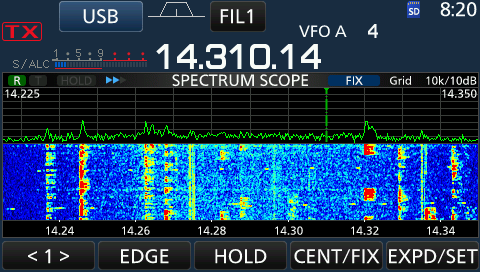 The spectrum scope displays important information in it’s header like, span, edge, speed, RX/TX markers and the FIX/CENTER icon. You can find all of the information in the full manual starting on on page 5-2. There is quite a difference between the two and I’ll go over it in the following clip. Also shown is each screen the mini scope will display on and how to quickly get rid of that annoying half screen. Thanks for coming by and if you have any comments, please post them below. Have you been using the mini scope? Icom went searching for the video. I think it’s this one, although I sometimes have more extreme effects in my setup. But, good to know the manufacturer says it’s normal for the 7300. I wonder about the 7610 software etc.?? I have a dimmer switch in my kitchen and when it is 1/2 on I have that and noise in the receiver. The IC -7610 NR does a pretty good job with it. The 7300 NR doesn’t do quite as well. 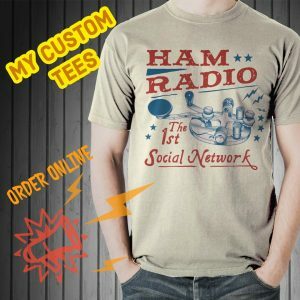 I know another reliable Ham who says the Icoms just don’t do a good job with pulse noise, like an electrified fence. I’ve been happy with both of my radios. I have an old video of my IC-7000 and some noise. I think it is from a transformer in my neighborhood. It was terrible with the IC-7000, but ever since I got the 7300 it hasn’t affected me much. The NR, filtering and RX is much better than the 7000. Thank you for contacting Icom America. Watched a video online on the “corderoy” effect. Based on that video the operation of the scope is typical of what will be displayed in really bad band conditions with high levels of interference and atmospheric noise. Thank you for the followup. Can you post a link to the video for us? On occasion, the noise baseline width seems to be amplitude modulated and it’s “width” varies at about 1-2 cycles per second. It happens with external power line impulse noise, and perhaps from the modulation peaks of a strong 1500 khz AM broadcast station nearby. Is this normal? I tried to find a technical discussion of interference effects upon an SDR digital design with direct A to D conversion-but nothing found. Nice to hear from you and thanks for putting up with the comment form, hi. On the 7300’s. I just bought a dell 23” all in one computer to get things a bit more organized. Thank you Jon and it’s great to hear from you and that sounds like a real good deal. I have an iMac and like the all-in-one approach. We’ve had it down in the 30’s, but it is getting into the 50’s lately for a high. No too bad for this time of year. I hope things are well there as well. Happy Thanksgiving and take care! do you think there’s any way to do this on the 7300?? That’s a good question. I have never used that kind of setup, but it would be interesting. You need a second receiver (or dual watch) and I’m not positive, but I believe I heard the Icom 7610 will have that capability. It’ll be interesting to see how it’s configured. Maybe someone else can jump in? Enjoyed the mini scope video. That raised a question – on page 5-3 of the “short” manual Touch Screen Operation is explained. Para. 3 explains that you can touch a portion of the band and the rig will change to that freq. I can make it do this – but for the life of me I can’t see much utility in it because I never get right on the spot i want. have you found any real benefit of this function? Nice to hear from you. I know what you’re talking about and I don’t use it much. 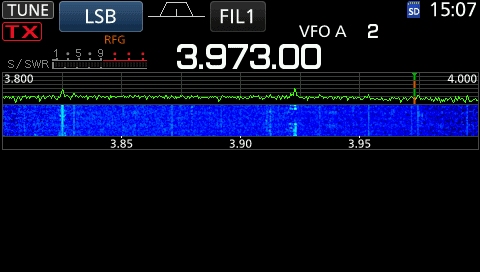 In HDSDR I can click on a frequency in the panadapter and 90% of the time it’s spot on. Maybe the 7300 just doesn’t have the resolution to accomplish exact frequency jumps with a touch. If someone else has better luck, please comment!